I'm a bit behind of the times with this one and, frankly, I don't know how it flew under my radar because it has lots of components that I'm often attracted to. For starters, the cover is awesome. Yes, it borders on creepy but it's more pretty than creepy so it all works out. Then, there was the premise: a kind of traveling magic circus with some sort of random intense competition between two magicians that blossoms into a romance. It's totally unique, borders on bizarre and is therefore sooo my kind of book. That said, it was an effort to get invested. 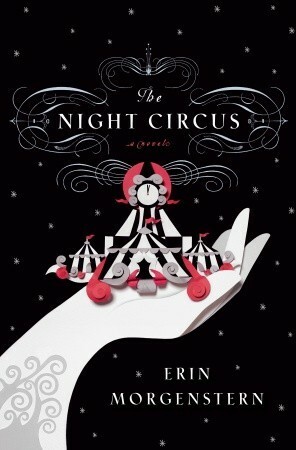 Unlike other books that sweep me away by the end of the first page, I had to put some work into THE NIGHT CIRCUS. The writing was solid, and was full of beautiful phrases and descriptions, but sometimes, the prose got in the way of letting me connect with the characters. After the first third, though, that went away and I was totally into it. Also, it didn't hurt that the traveling circus in question had a colour scheme of black and white, which is my theoretical favourite décor concept (I say theoretical because it's dramatic and awesome--like, The Snow Queen's office in Once Upon A Time...oh yeah, I die for that office, but it's far too cold to ever live in...which makes it perfect for The Snow Queen because, you know, she's cold. Okay, I'm digressing. Let's get back to the review). Just to be clear, Le Cirque des Rêves isn't like any old circus. Oh no, no, no. It opens at dusk and closes at dawn, appears with no warning in the middle of a field, and there isn't a clown car in sight. Most of the acts have their own tents, and the circus features only the very best magicians who create unique and one-of-a-kind experiences for those who are fortunate enough to stumble through the front gates. So, you can see why it's pretty much the best setting ever for a magical competition. But, as much as the premise of THE NIGHT CIRCUS is about a magical competition, there isn't much tension because the competition is so discreet that, for the majority of the book, one of the characters, Celia, doesn't even know who she's competing against. However, the other MC, Marco, does know that Celia's his opponent, which gives him a slight edge. But, like I mentioned, the competition isn't all that fierce, and although the two characters are constantly talking about it, the concept fell flat for me because the timeframe for the competition is basically forever and you never really find out why the competition is happening in the first place. Sounds kind of boring right? Well, in a way, yes, but in another way, no, because the most interesting part of THE NIGHT CIRCUS is that, for the first time ever, I was way more invested in the characters than the plot. Usually, I need to sympathize with a character to enjoy the plot but with this book, I kept reading so I could know more about Celia and Marco, instead of just what happened to them (which is a good thing because, like I said, there isn't a whole lot that actually happens in regards to the competition). So look, this book is pretty great. There are a few things that I wasn't a super fan of, and it was slow in the beginning, but it's still a solid and entertaining read. And although this review doesn't have a ton of information about what happens, it's because THE NIGHT CIRCUS is the kind of book that you have to read yourself to truly understand. So, if you love gorgeous imagery about the majestic mystery of magic then you'll probably want to pick up a copy. And hey, you know what's just as awesome as a great book? A great manicure! Click here to see to see what kind of pretty and creative things that other bloggers are doing with their nails! And if you want, link up and show yours off because there's always room for new manis (not that I'm obsessed or anything...okay, maybe just a little). I really loved the Night Circus! Did you know that the first draft was written as part of NaNoWriMo? I really enjoyed the night circus! I'm going to read it this fall, I have no idea why I feel like it's a fall book, but it is to me haha! i read this awhile ago and it just was ok,i felt it was too long and sometimes confusing but i loved the whole night circus idea. I'm behind the times on this one...I will read it one day because everyone says it's amazeballs. I had similar issues with this book! I wish that the writing helped the characters to shine more, instead it sometimes muddled it up. And the jumping around confused me a bit. I'm better with books that are more straightforward in timeline, haha. But it was a haunting and beautiful story and I totally did get into it!